Probably the only one of its kind in the world. The temple honours a resident named Chor Soo Kong, who had healing powers. He was a Buddhist monk, who moved to Penang. The story tells about him great myths and legends of this deity�s power as a healer. Some devotees from as far away as Singapore and Taiwan come to pray in the temple on Chor Soo Kong's birthday (the sixth day of the first lunar month). Even more snakes appear on this day. 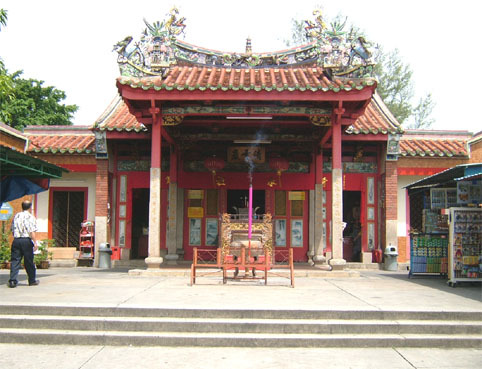 Snake Temple was build around 1875 for the memory of Chor Soo Kong. In 1873 when David Brown, a British resident found out about Chor Soo Kong and prayed to him he was apparently cured of an illness. It return for his cure David Brown donated a tract of his land so a temple could be built for the homage of Chor Soo Kong. The statue of the deified healer was brought to Penang by a monk from China. The legend is that this pious monk gave shelter to the snakes of the jungle; when the temple was completed, the snakes moved in. The temple is famous for a number of poisonous snakes inside it, which is rare in the whole world. The Snake Temple is located at Sungai Kluang on the way to Bayan Lepas airport in the Penang Island. Many tourists visit the Snake Temple. Buses stop, tourists get out and have a quick look at the snakes in the temple. Walking to the temple you find souvenir stands on both sides of you. Here you can buy your camera film or just a nice souvenir. In front of the Snake Temple is a big incense burner, where they burn large incense. Inside the temple, in the Main Prayer Hall, is filled with the smoke of burning incense Some people say that the snakes get paralysed by the incense. The snakes are pit vipers. It is the sacred smoke from the incense which is supposed to render the snakes harmless. Today the resident vipers are devenomed. In a bowl are eggs. That's the food for the snakes, but they are nut hungry. Although poisonous, these snakes are not known to bite. Devotees refer to them as `officers' of the deity and regard them as `holy and harmless'. They tell us that no one was ever bitten by a snake. Be careful; they stay "wild animals". These snakes have long hollow fangs, which will inject you with a proteotoxic venom, this type of venom wont paralyse you but will eat away at you from the inside out. The venom is basically a highly-evolved digestive fluid which will start destroying your cells, blood and muscle tissues. On the right site we can give a donation for the temple. You have to sign a book and to write down your donation. Looking at the book it must be very profitable to own a temple like this. A 600 pound bell made in China during the Manchurian Dynasty (1886) still hangs in the main hall. It is rung on the 1st and 15th days of every month of the Chinese calendar to invite the denizens of heaven and hell to pray. At the back of the temple is a snake pool. Not filled with water, but with fruit trees. At the first sight I see no snakes over here. But if you have a close look than you will see snakes coiled on the branches of the tree. At the back of the temple complex was a man, who assured me the snakes inside the temple were not de-fanged and were all extremely venomous. They were not doped in any way, but were simply friendly spirit snakes, who used to live in the surrounding Penang jungle and as development increased and the surrounding trees were felled came to find refuge in the Temple and were its guardian spirits. He told no had ever been bitten since the snakes began coming. The snake temple is free to enter and is a very interesting and unusual stop and well worth the trouble. Don't be put off if you have a fear of snakes either. When you're leaving the Snake Temple are photographers, who want to take pictures of you with snakes draped around your head and neck. It is perhaps the only temple of its kind in the world. Every year, there are some celebrations held there, such as the celebration of Jade Emperor�s birthday.